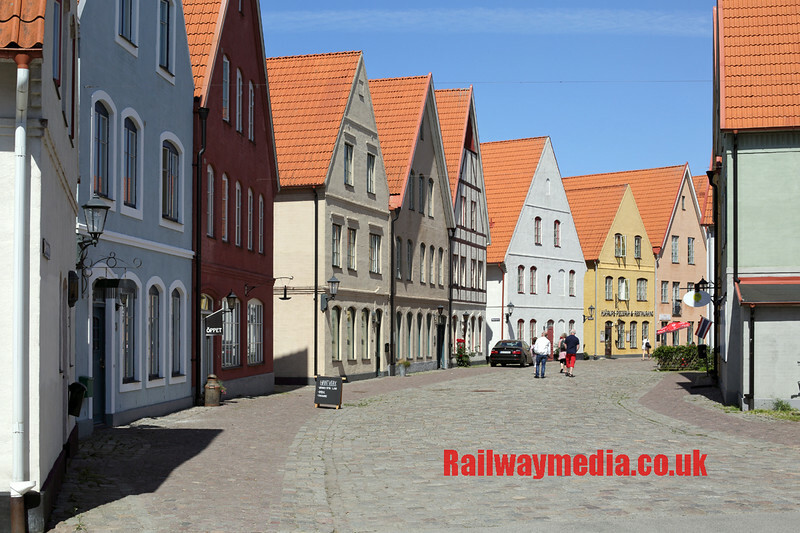 Hello and a warm welcome to the latest Railwaymedia blog covereing my recent(ish) holiday to Germany, Denmark and Sweden a few weeks ago. Usually I'm pretty quick at downloading, captioning and processing all the pictures once I return but this time it has taken me several weeks to catch up with them, hence the delay in writing about where I went and what I saw! 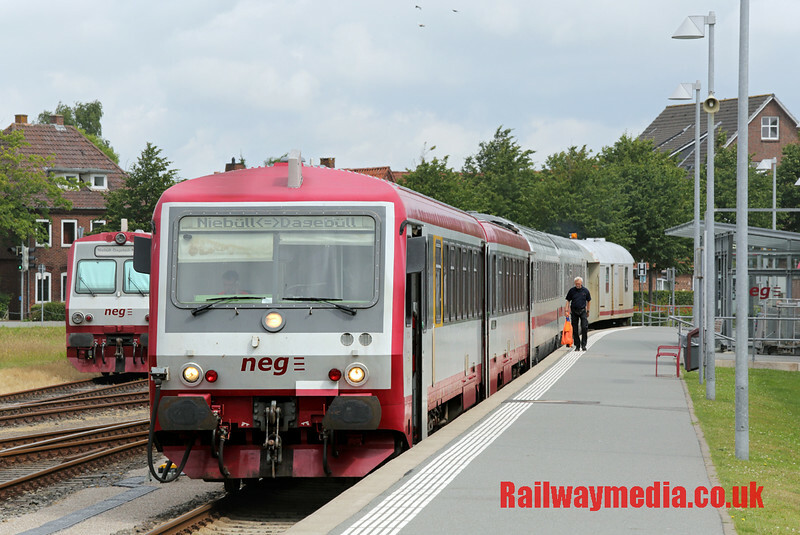 The main reason behind our choice of destinations for the trip was the planned diversion of all Denmark to Germany freight trains via the diesel only route via the Marschbahn which runs from Tønder via Niebüll down to Hamburg. 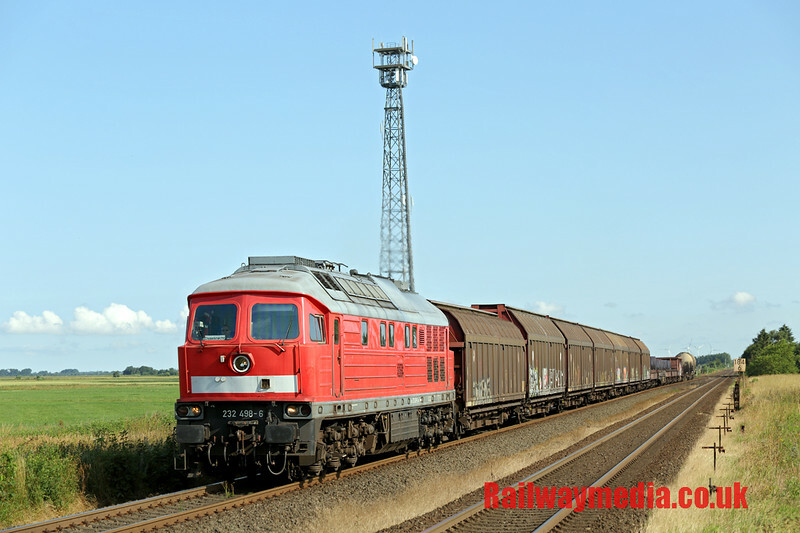 Usually freight runs via the electrified route through Flensburg but engineering work on that line for the second year running necessitated the diversions. It is an interesting area to visit anyway as all trains on the route, currently, are diesel hauled with Nord Ostsee Bahn providing the roughly hourly 'local' service from Hamburg to Westerland using ex Norwegian MAK diesels and more modern Siemens Eurorunners, and Deutsche Bahn's Inter-City service utilising pairs of class 218 'Rabbits'. 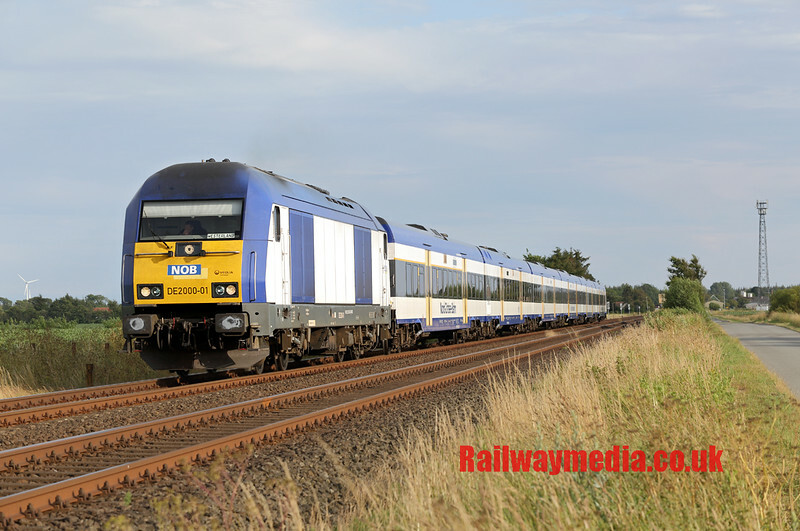 In addition to this, as Westerland is on the Island of Sylt which is only accessible by train there is a frequent service of car trains between there and Niebüll on the mainland, also at the moment hauled by class 218s. New diesels are on order though. After an evening arrival in Hamburg on Sunday night there was just time for a couple of evening pictures at Hamburg Altona station. 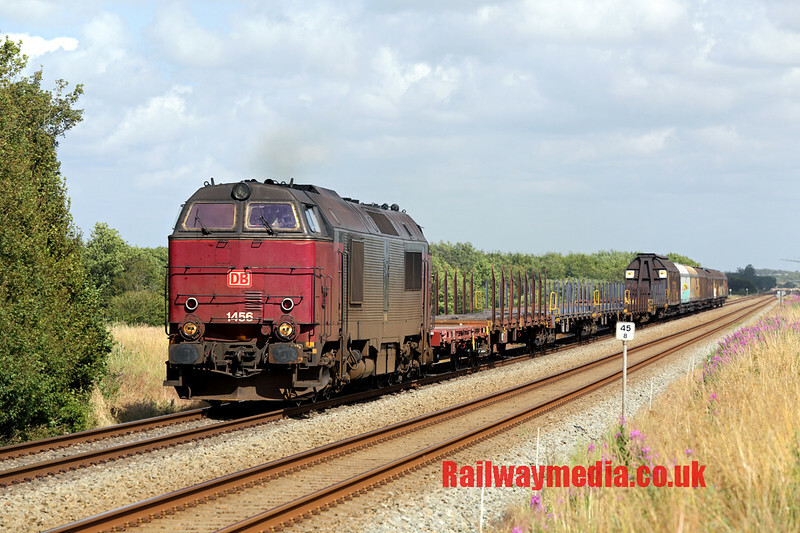 There are still a few local DB hauled trains in the Hamburg area, mainly using class 112 electrics (similar to the former East German BR143s), principally on Regional Expresses from Altona towards Kiel and also on the frequent trains on the line from Hamburg Hauptbahnhof towards Lübeck, which has been electrified since my last visit to the area. Our evening meal was in the Paulaners 'Miraculum' opposite Hamburg Hauptbahnhof, several litre-sized tankards of Weißier being in order. We stayed in the Novel Hotel Alster St Georg which was only 5 minutes walk from the station and very reasonably priced for where it was located. 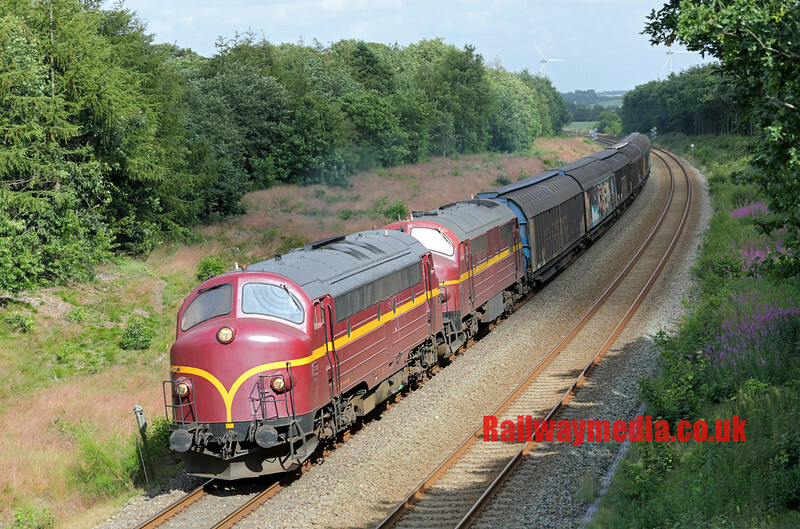 One oddity of the operation of these Inter-City trains is that most convey through coaches to Dagebüll Mole. Whilst Westerland is itself on the Island of Sylt there are several other Islands in the area served by ferry services from Dagebüll. For the coaches to reach here a complex shunting move takes place at Niebüll with the DB train locos taking off the front two coaches, attaching them to the back of private company NEG's branch unit which then in turn has to attach to the rear of those a generator van to power the electrics for the coaches. The Deutsche Bahn locos then take the rest of the train to Westerland and on their return the whole process is reversed. 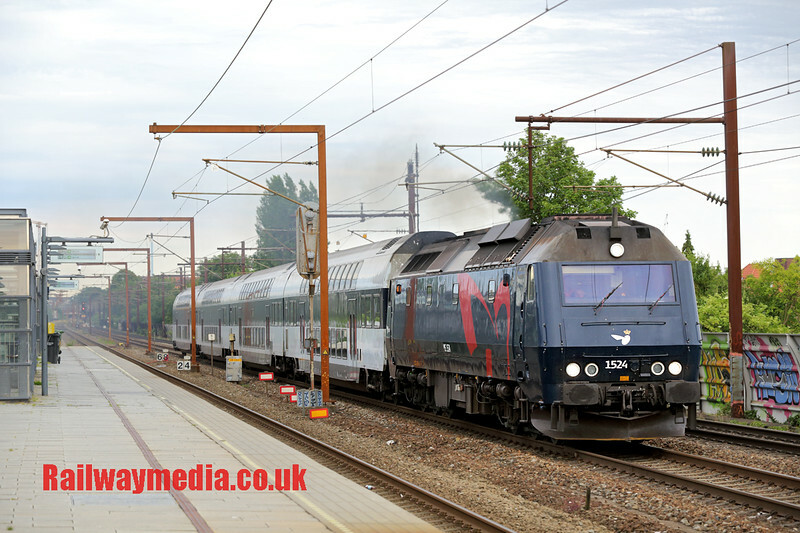 The front two coaches off our train are seen above attached to the DMU and generator van in the adjacent NEG station. First stop photographically was Langenhorn, the first station south of Niebüll, and an excellent all-day photographic location with shots available in the morning south of the station and all afternoon and evening from the road that parallels the line to the north. This was another place I had visited back in 2007 and we returned several times on this holiday. We spent the first afternoon there hoping some of the diverted freight would appear. Several did although it was a bit dull. The evening was spent the other side of Niebüll at Morsum on the Island of Sylt where there is a nice bar located on the station. After a little while the owner and her friends were highly amused that we kept disappearing every time we heard the level crossing gates go down. With several NOB trains and car shuttles (autozugs) each way every hour, this happened a lot. We had a couple of hours there before retiring to the convenient and highly recommended Hotel Insel Pension in Niebüll. The following day was another full one spent in the area and we decided to do the long (approximately 6km) walk from Klanxbüll station to the start of the Hindenburgdamm, the 11km causeway which is the only fixed link between Sylt and the mainland. I really should have taken a hat as we had uninterrupted sun all day and, although it was a tiring hot walk in both directions, well worth it. The new engines on order to replace the 218 'Rabbits' are due to start arriving by the end of this year so it was probably my final chance to photograph them at work on the Autozugs crossing the dam. Just a word of warning though-walking along the dam itself is strictly forbidden. A few shots to illustrate the location: when we first arrived mid-morning the sun was just right for trains heading east coming off the dam heading towards Niebüll, as the sun moved round it obviously started favouring the view the other way. The NOB locos are usually on the Westerland end. One further location was round the landward part of the causeway towards Klänxbull and we had a further hour or so there. All in all it was about a 75 minute walk each way. We had 30 minutes respite changing trains at Niebüll to stock up with beer from the garage near the station, much needed, before we returned to Langenhorn for the evening. Once again it was a diet of Inter-Cities and NOB push-pull services with a slightly disappointing number of freight trains. We only had a rough idea when they would be running as we had the previous years timetable to go by, this being the first week of the diversions. The following day we did acquire an up to date one which proved to be much more accurate. I shall spare you more details of Langenhorn that evening but we finished off the day with a nice pizza from an Italian restaurant not far from Niebüll station. The next day was a move from Germany and into a new country for me, Denmark. Usually there is a roughly two-hourly train service provided by Arriva Denmark from Niebüll to Tønder and up to Esbjerg but due to the freight diversions over this single track route all services to Tønder were replaced by buses and only a handful of trains were running north of there to Ribe. This was then the second time I've crossed an International border on a local bus (the previous being Eupen in Belgium to Aachen in Germany). 20 minutes in Tønder bagged a picture of a waiting freight before the Arriva unit appeared to take us north towards Esbjerg. The junction of this branch and the Danish 'main' line is at Bramming; we alighted at Tjæreborg, the only intermediate stop bewteen there and Esbjerg. Although the station didn't look too promising on Google Maps it proved to be a reasonably good spot. 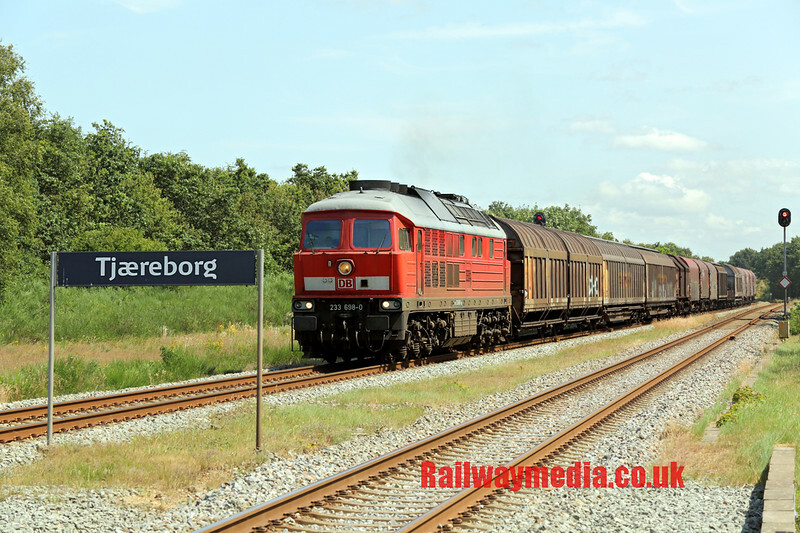 The main advantage of the location is because there isn't room to do so at the junction at Brammiing all the diverted freight trains have to head west to Esbjerg before going back east towards København, so every train has to pass Tjæreborg twice. 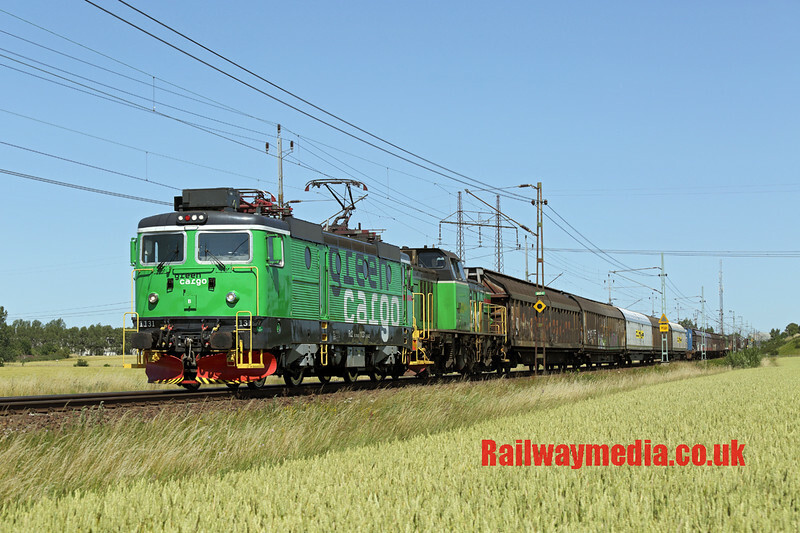 We weren't sure exactly how things worked but it turned out that the German BR232 and BR233 'Ludmillas' which were powering the trains up from Germany were replaced at Esbjerg by former Danish Nohab 'MZ' Class diesels for the run to Fredericia where the usual electric took over. 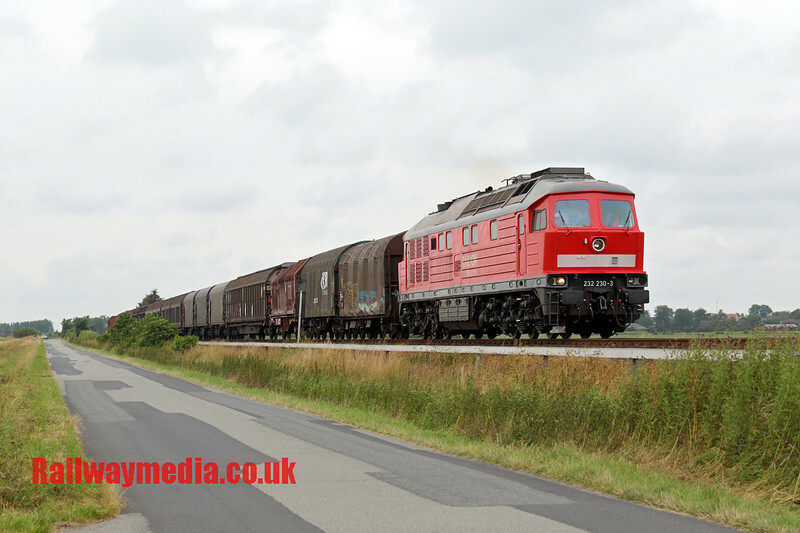 I had hoped to maybe see one or two of these MZ class engines but as it turned out there were five in regular use operated by DB Schenker Rail Danmark plus a couple more engines hired from other operators. More about these later on. This particular day we remained on the station. The view of westbound trains (above) was reasonable, especially in the afternoon when the sun became better, eastbound trains were on the near track so a shot of the end of the platform was more constrained but at least with signals each way and the passenger timetable, we had plenty of warning when something was approaching. We were heading across to København that evening so had to leave at teatime. We went to the junction station of Bramming for the final two hours and were lucky to discover that the local railway society were running two return trips from there to Lunderskov each Wednesday for a few weeks in the summer and the second trip of the day was due to return. Unfortunately we had no idea which platform it was to arrive on, it came in on the wrong one for the sun, but was still nice to see. 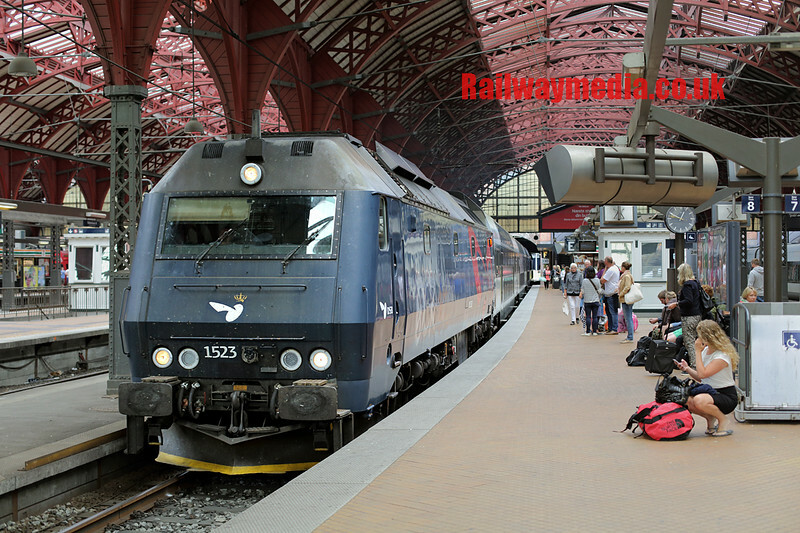 We stayed at the First Hotel Taastrup near Høje Taastrup station on the edge of København which is very convenient as every train heading west out of the city stops there. It worked out about £55 a night which for Denmark was very cheap. 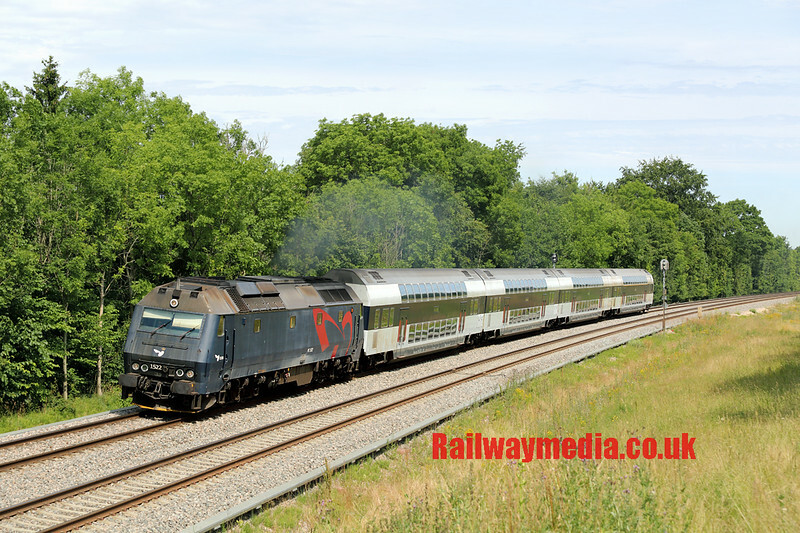 I had three full days left, the main aim being to get pictures of the ME class diesels used on passenger trains out of København but with Tim only having one full day left we decided to wait for those and instead the next day to do another new country, Sweden. 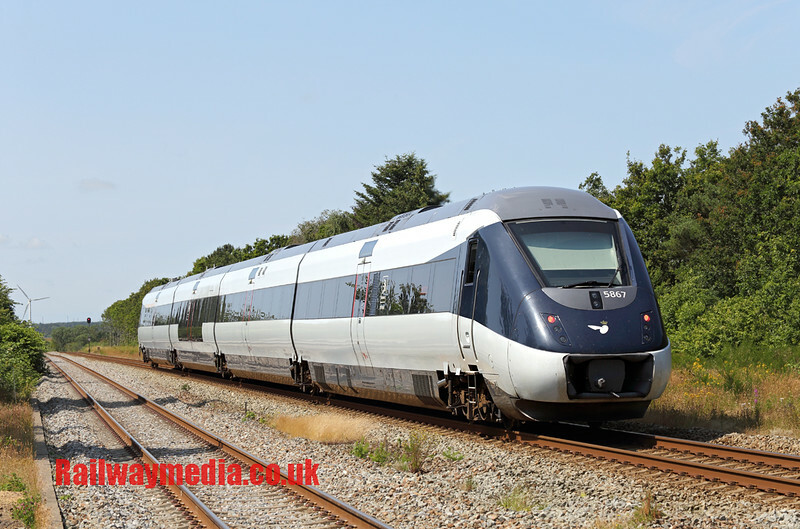 There is a fantastic rail service between København and Malmö, peak hours they are every 10 minutes, using the Øresund Bridge and Tunnel which gets you across the approximately 8 mile strait seperating the two countires. 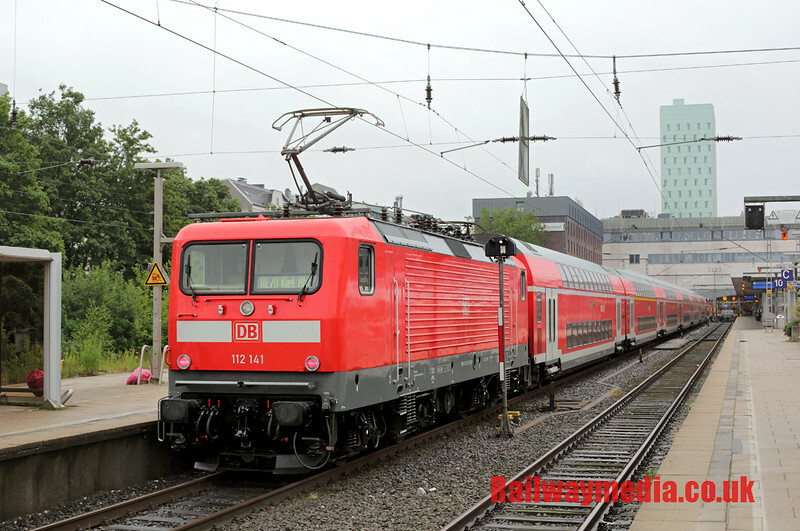 The service is operated by a large fleet of three car units which not only link the two cities but also provide the local services from København to Helsingør and Nivå on the Danish side and long-distance services from Malmö to as far north as Göteborg in Sweden. I had looked at possible locations to visit in the Malmö area and one that seemed from google Maps to be reasonable was Hjärup on the mainline between there and Lund. North of Lund the line diverges, left towards Göteborg and right towards Stockholm so before Lund seemed to be the best bet for getting any freight that might run in the country having struggled to find much information on the internet about traffic patterns in Sweden. I had therefore hoped to maybe see one or perhaps two freight trains but as it transpired there was almost one an hour, counting both directions together. With another day of unbroken sun though we could only ever really photograph trains heading south. In between the occasional freights there was an never ending procession of units. The particular spot I had identified was just south of Hjärup station where there was a grassy mound near a road. On Google Maps this looked ideal however foiliage and lineside cabins made it not as good in real life as it had appeared on the computer. The Hector Rail train above appeared whilst we were investigating what turned out to be an official patch of grass for use as a dogs toilet. 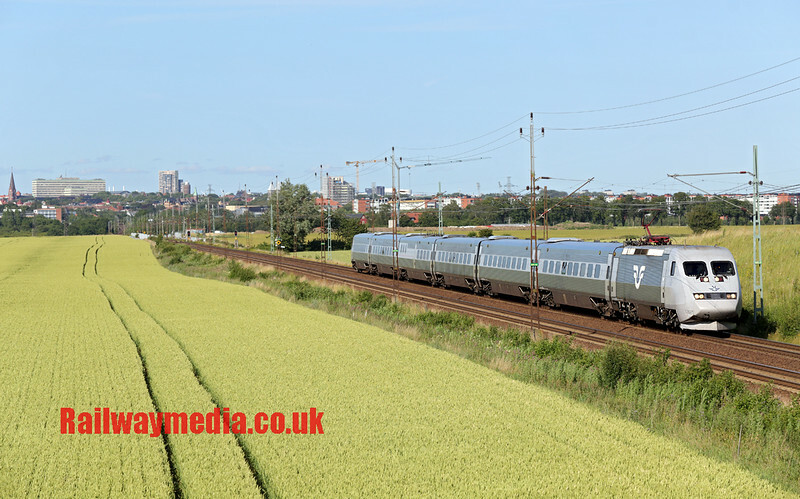 We therefore made our way along the edge of the cornfield further on which looked better and had a very pleasant hour watching the frequent Øresund and local units, regular Inter-Cities and freights. The sun was starting to get a bit head on so we made our way back to Hjärup station. Originally we had thought of moving on at this point but with such a busy line, perfect weather and a reasonable location we decided to spend an hour in the very odd village of Jakriborg. We had spotted this quaint old village as we alighted from the train so found a cafe and sat for an hour or so whilst the sun moved round enough, having a couple of expensive Swedish beers. Something didn't seem right about the place though and a quick look on the internet provided the answer as the whole village, complete with cobbled town square, only dates from the late 1990s! 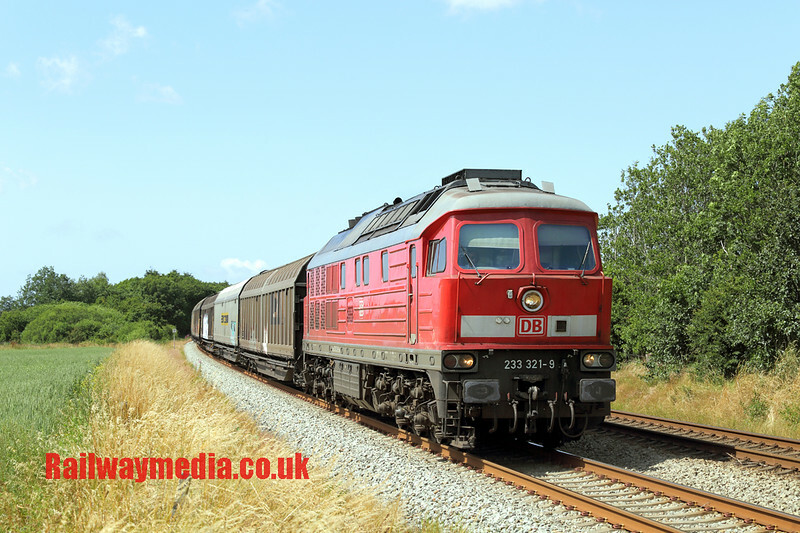 Once the sun was beginning to get more side on to the railway we decided to investigate the railway just north of the town and came across the perfect location to spend the rest of the day. A large mound again, similar but larger to the one to the south of the station, this offered various viewpoints of the line looking towards Lund. We finally left there about 8pm but we could have had another hour or two more with the sun setting across the open field. 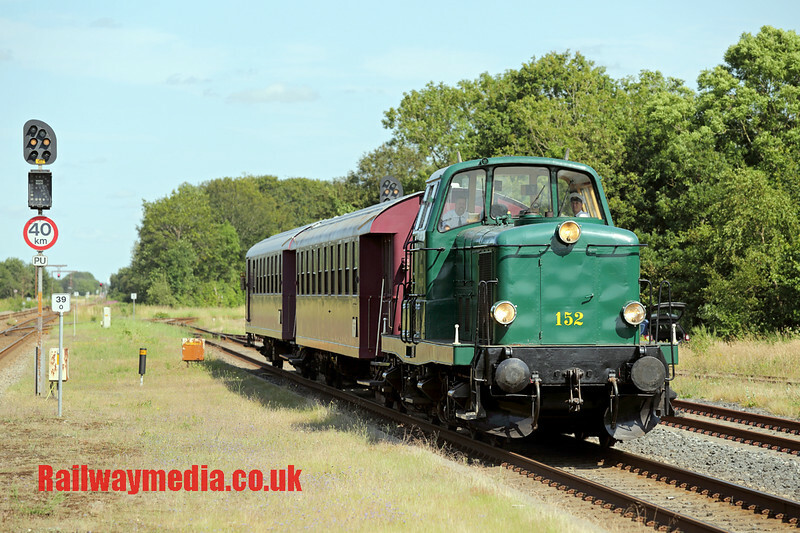 Certainly the shot of the holiday up until that point (and there had already been a few contenders) came about an hour after we returned lineside with a pair of Green Cargo (the former national freight operator) Rd2 Electric locos. This section of line sees between three and six Øresund trains, four local Skånetrafiken units and one or two SJ X2000 Inter-cities each way every hour. To be honest after I had exhausted the many different views you could take them from by the end I wasn't botheroing pointing my camera at most of them! The X2000s I found though particularly photogenic, reminding me of an East Coast class 91 in a way, the locos are virtually always on the south end heading towards Malmö and København. We decided to call it a night eventually and headed into Malmö for tea. There was no rush with Øresund trains all night and the last train from København back to our hotel about 0230. Malmö is a lovely city but take plenty of money! It was a Thursday evening but very busy though we managed to get a table in a steak restaurant; a few beers and a meal for two came to just under £100. Before we caught the train back to Denmark we called into the main bit of the station (most trains now use the underground section next door) to see the nightly Stockholm sleeper train. All in all a visit to Sweden is well worth it. As expected it was a really nice country but it might be worth your while taking a packed lunch from Denmark if you do a similar day trip to us rather than eating out! 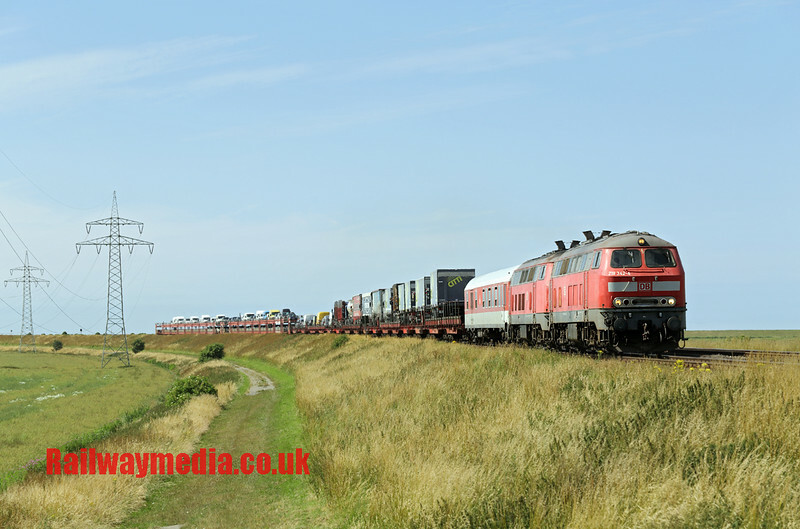 So the next day it was time to bag a few pictures of the Danish Railway's ME class diesels. I was quite impressed with these big, noisey diesels with some producing copious amounts of exhaust fumes. 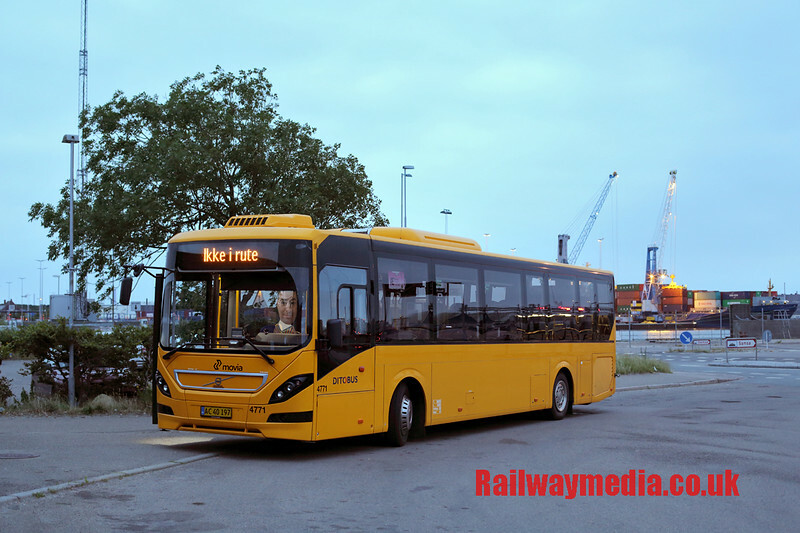 During the day there are four departures from København every hour that can be hauled, although the relatively new Ansaldobreda DMUs are starting to make inroads into this. 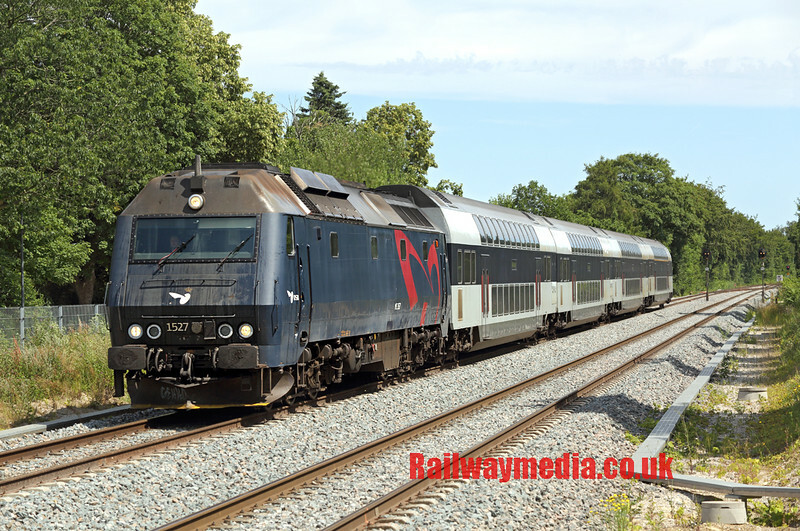 A long running saga like the Ansaldobreda built high speed units for the Netherlands, they were meant to be in service in 2008 but still aren't authorised to run in multiple. I'm guessing when this finally happens it will probably be the death-knell for the MEs. Going by the dreadful noises the gearboxes on the new units make though the diesel locos might be safe for some considerable time however! 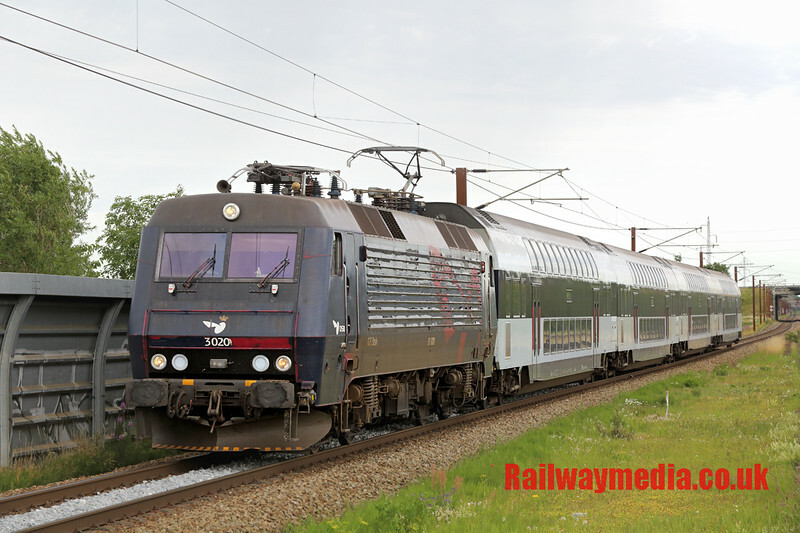 Anyway, the MEs generally run hourly to Nykøbing F, hourly to Kalundborg and most of the twice-hourly stoppers to Holbæk, the latter two destinations being the same direction meaning upwards of three an hour on the recently doubled branch from Roskilde to Holbæk. 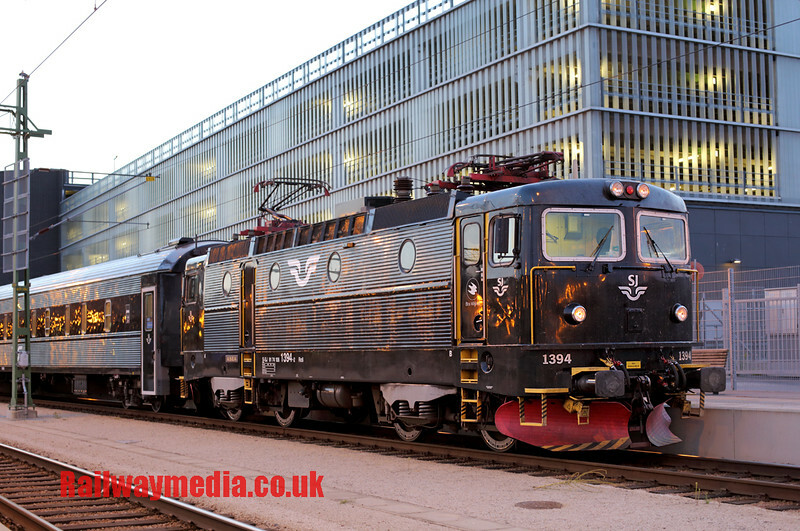 All of these operate along the mainline as far as Roskilde and served our base at Höje Taastrup; the engines are on the western (country) end of the double-deck rakes so light is generally best for them in the afternoon. After a few shots at the station of Trekroner midway between Taastrup and Roskilde, once the sun had moved round enough we ventured onto the Holbæk branch. The first stop at Lerje had looked promising on maps and the recent double tracking of the route helped as it has cleared quite a bit of vegetation. The shot from the end of the platform looking east was pleasant enough. After a couple of pictures here both of oncoming trains and going away shots, we investigated a footbridge about half a mile to the west. Again with the lineside clearance this proved to be an excellent location. We were there about 2pm but maybe an hour or so earlier would have been better as the light was just starting to get head on. The sun eventually went in anyway, though not before we had managed a few shots of passing Ansaldo units and a few class ME's too. With the clouds increasingly moving in we headed back to Trekroner to track down the one all day diagram for the class EA electric locos that exists on the Østerport to Roskilde stopping services. The light, when the sun made the odd appearance, was ideal mid-afternoon for trains on the 'slow' line coming out from København though wrong for fast line trains from that platform. It was even trying to rain by this stage (how rude) so we headed further into the city. From Høje Taastrup the mainline becomes two track with just one intermediate station as the others are served by the 10-minute frequency S-Tog. The best station we found was Danshøj, by my reckoning late evening the sun would be ideal for trains coming out on the mainline. There was a steady procession of ME diesels and units to watch which passed the time before Tim had to head to the airport. With myself being the last man standing, what could I do on my own in Denmark on a Friday night? Well I decided on a trip to Kalundborg on the train taking a stock of beer which was far more pleasant than festering in a pub or bar on my own. I had of course no idea what Kalundborg was like, I had about 30 minutes there whilst the train was serviced. It turns out Kalundborg is a container and ferry port and, at least round the station, not much happens on a Friday night. Fortunately a 5 minute wander and I found a Netto that was open until 9 o'clock so I could restock for the journey back. The final full day was of course mine to choose what to do. It seemed daft not to revisit the Tjæreborg again as we had had such a good day on the Wednesday. I got up reasonably early for the three hour journey, of course returning back to Taastrup would be late on so like the Kalundborg trip the night before was just a case of stocking up on enough beer to enjoy the scenery. Rather than stay on the station this time I went for a walk and found a farm track I had spotted from the train located just over a 20 minute walk to the east of the village. This turned out to be a nice spot, the bend of the line wasn't quite right for eastbound services but the sun was moving from the front by the time I arrived anyway. I settled down to about 3 hours sat there during which time I didn't see another person so relaxed on the banking with a book and a bottle of coke awaiting trains. The view looking east was much better and with the line dead straight offered plenty of warning of approaching trains. This caused a bit of consternation at times though with the very fast moving clouds wondering if the oncoming train would arrive before the next cloud. I probably had a 50% success rate with this but at least got one of the required MZ class locos in sun. Between Tjæreborg station and the farm track was a road bridge. Tim had checked it out earlier in the week and it looked a nice view. 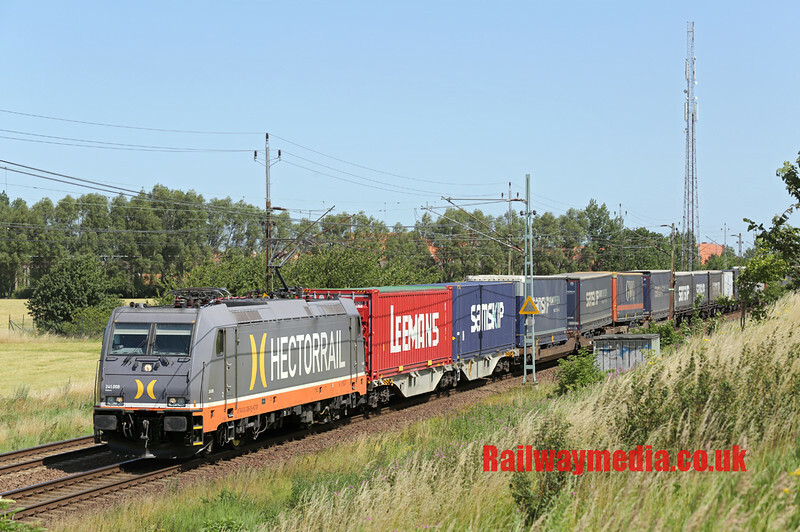 Having got the westbound freight pictured above I reckoned I had time to await the next eastbound one and get to the bridge before the following one heading towards Esbjerg, however it came much sooner than expected, though fortunately before I started walking. I went to the bridge not expecting much to come so I was therefore a bit suprised to see the signal beyond the station clear when I knew no passenger trains were due, and even more so when I heard a loud noise from around the corner. Whilst the MZ's were built by Nohab, when that manufacturer is mentioned most people think of the earlier MX and MY classes which were much more streamlined and stylish. CFL (Luxembourg National Railway) Cargo Denmark own a few and it was two of these that appeared, though for a second I thought the clouds would spoil things. These by far trumped the Green Cargo Rd2s as the 'shot of the week' as they are rare enough to see in action as it as let alone a pair on a freight train, and I returned to the station via the supermarket to pick up some beer to celebrate. This line is in the process of being electrified so the three views above may change considerably in the next 12 months if diversions take place next year. I only really had Sunday morning left as it was a mid-afternoon flight back from København to Manchester. 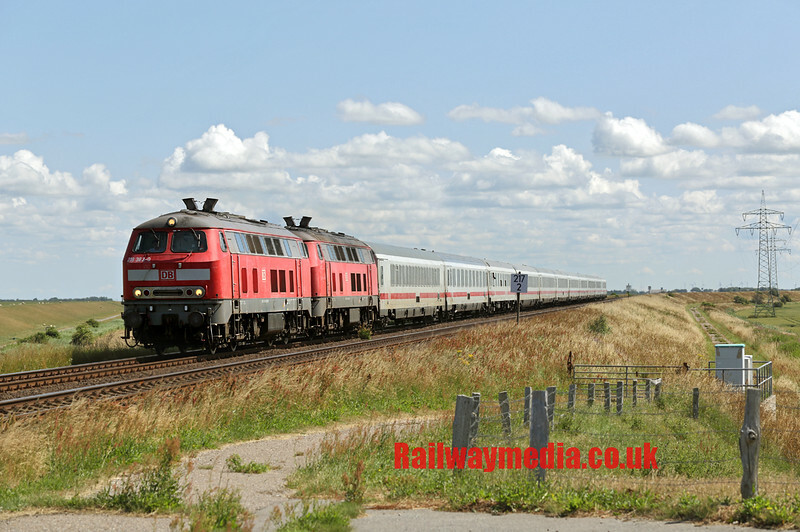 I went the other side of Roskilde for the last few pictures of MEs, a number of which operate even on Sundays. I finished off seeing a little bit of København itself. In my mind it is nowhere near as nice as Malmö but maybe I missed the decent bit. The final shot of the holiday was taken in the main station, a lovely building but not very easy for photography. All in all a very successful week away with two new countries covered. 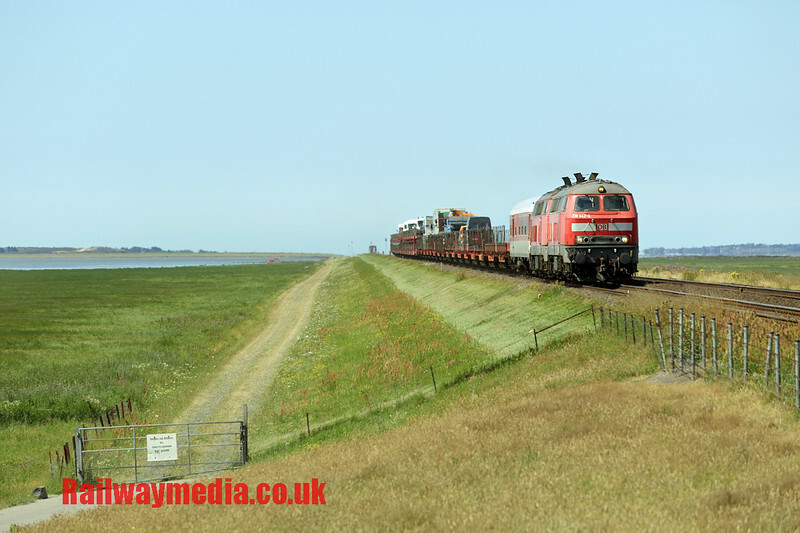 I liked Denmark but apart from the diverted freights and the ME diesels there isn't an awful lot else of interest. Sweden I would like to see more of, maybe when I have won the lottery. North Friesland in Germany I would recommend anytime, even when next year the 'Rabbits' have been replaced. All the pictures can be found for a short while in the New Additions section before they will be moved to the 2015 Trips folder. I hope the details of the locations etc will be of use, especially if the Denmark to Germany freight diversions take place next year. Thanks as always for taking the time to read this, please look out for the next addition of the blog and I'll leave you with a picture of two men and a level crossing, I'm not sure where the third of our group was... Bye for now!